A view of the old church building from our courtyard. 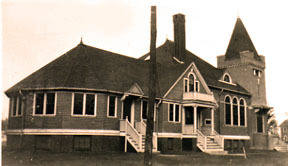 On October 14, 1897, a group of 15 people assembled in the old Eden Park School on Colonial Avenue and thereby launched a movement which culminated in the establishment of our church. The new organization was named in memory of the Reverend James L. Phillips, M.D., D.D. (1840 – 1895), medical missionary in India, who had served as an interim pastor of People’s church in 1886 during part of his last furlough. The cornerstone of the first edifice, at the corner of Pontiac and Branch Avenues, was laid January 6, 1901 and the building was dedicated on October 23 of the same year. The first service was held on Easter Sunday. In 1924, the basement was excavated to make room for a growing church school and in 1972 – 1973 it was completely renovated into a modern Children’s Center. By 1940, attendance grew and it was decided to erect a new church at the corners of Pontiac and Colonial Avenues and join the two buildings together. Ground was broken on May 18, 1947 for the basement and services began there on September 12, 1948. Work started the following March on a new sanctuary which was completed and then dedicated in March of 1956. Phillips Memorial Baptist Church in 1920. The beautiful steeple of Phillips Church can be seen from miles away. Notice the "ship's wheel" designed windows which match the golden cross atop the steeple. On May 29, 1994, we celebrated Dedication Sunday for a three-year fundraising campaign entitled “Reaching for Tomorrow.” The success of this campaign allowed us to build a new elevator reaching all levels of the church, to install a new heating system, to retire our roof dept and to share in the fund drive for Canonicus Camp and Conferencing Center. On a beautiful sunny warm Sunday, April 21, 1997 after church services, we dedicated our new addition and elevator while gathered together in our new courtyard. We and our neighbors agree: IT LOOKS LIKE IT HAS BEEN THERE FOREVER! 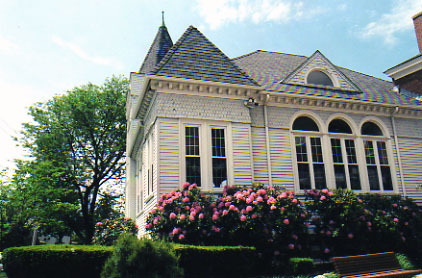 During the past century, the church grew from its original 15 members to have one of the largest congregations of its denomination in Rhode Island. It is affiliated denominationally with the American Baptist Churches of Rhode Island and USA; and interdenominationally with the Rhode Island and National Council of Churches. In our spirit and programs, we are community minded and ecumenically oriented with members coming from many denominational backgrounds. Phillips Church today is characterized by a strong pastoral and music ministry with many small groups, Bible studies and an effective mission outreach. The Roger Williams stained glass window is a delightful welcome to Phillips Church. 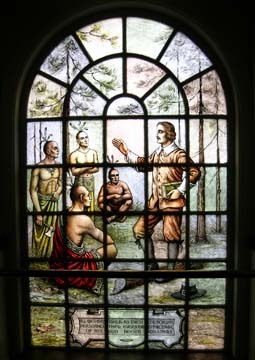 Founder of New England's "Free Church," Roger Williams befriended many Native Americans, including Canonicus. Williams established the First Baptist Church in America in neighboring Providence. "Building A Future of Hope" campaign was launched in the fall of 2006 to underwrite the rebuilding of the Church kitchen, upgrade the fire-safety system, restore external facade, and replace fellowship hall floor. Pledges totaled $420,000. For more information about our Phillips history and who we are named after, click on the link below for access to the web book, "Dr. J.L. Phillips, Missionary to the Children of India". Any information quoted, used or taken from the book must be credited to "Forgotten Books".